There are 3118 posts in this topic. You are on page 3 of 63. Depending on the firmware, the sounds can be located at different places. When I figure out how sounds are implemented, I'll post a new version. You're right, but I'm still missing some informations to make it work well. When it works, I'll commit all my changes (regarding sounds) in a new version. Thanks for this, it is very clear. For tests 1 and 2, your are trying to patch very low resolution image (17 x 23); Converting a 100x100 image to this format will always involve a great loss. However, I tried with a 17x23 image, and there is still an issue (similar to tests 3&4). I think it' an anti-aliasing issue and it should not be a big deal to fix. I'll also add the image size on next version. [EDIT]I confirm that it's an anti-aliasing issue, but also a problem with odd width images (17). See the change log at the end of the original post. In the future, it might be possible to replace compressed images "in place", but it requires the full index table to be recalculated and written (because the size will probably not be the same). I can do this, but I prefer not untill the current version is fully tested. You are a genius. Thankyou for your efforts. I will try the new version out right now. Yes this is a major improvement. Not only can you export, but you now know the exact size of the image in case you want to reproduce it. Great work! What do you mean by "no free memory on Tron" ? Do you get this message for the first image you try to replace ? 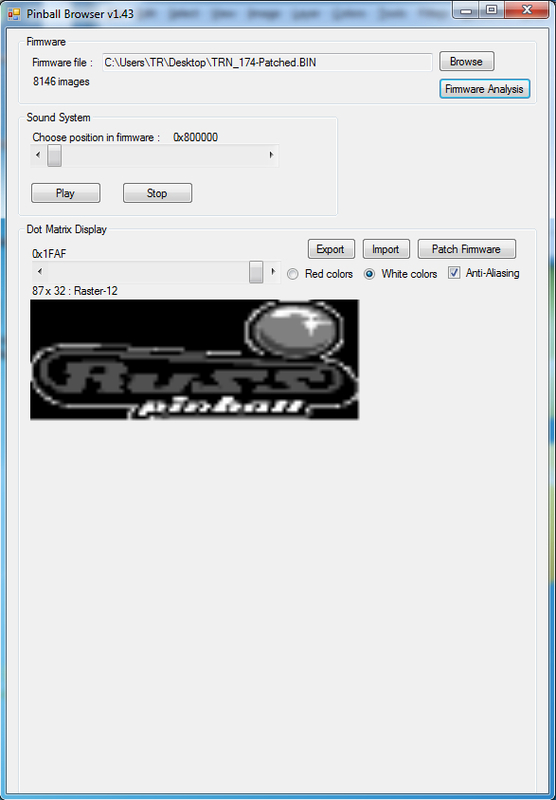 Raster-0 has the same limitation than compressed images : it is not saved in-place (it could be, because the length is always the same, but I didn't do the conversion to this format). Did you get an error at the end of the upgrade ? Or, you can be really simple.. and just put the file/folder on a dropbox account and share the link. What i mean is that i cant replace compressed-7 images (like the stern logo). When i try, i get an error message: Error-free memory has already been used) I understood your explanation to say you can only overwrite the raster images if there was no free space. Needs a way to delete some sections to fit more in for Tron. I made a pretty cool Gem animation and it would only let me upload just one picture frame. If i could upload multiple pics, i would use them as frames to replace the animations. EDIT: I might be able to get a short version of the animation working, but i will have to reduce the quality quite a bit. There is a whole arcade segment in the rom thats not used. What would happen if you removed the arcade segment and loaded up your GEM. How do you point the animation to the correct frames? 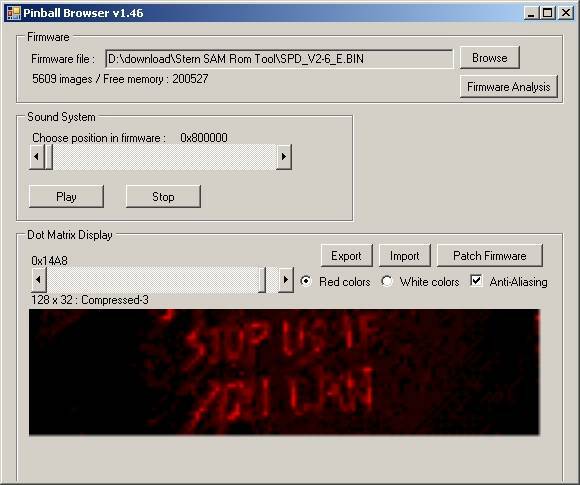 If we could insert multiple images at every next frame point, then click on 'patch firmware' it could possibly work. When i try to do that it patches the firmware with the first image in the sequence only. The only way i thought to get the rest of the images in there was to patch the patched firmware, then patch the second patched firmware and so on until all the frames were loaded. Sadly, it would not let me load up more than one image that way. However, I cannot test it in real; so let me know how it works. Just tried the new 1.45 and its still the same. I cannot load more than one image into the gem video sequence. It does appear that i can only load the images into raster-12 locations. All images in the gem video sequence are raster-0. It does allow me to change just one image in that cluster of raster-0 images, but when i patch the firmware and reload it for playback, the image is not in the place i selected and is now a singular 'raster-12' image amongst the raster-0 images. If i import an image then move onto the next frame and try to import another, the first image is forgotton and only the next selected image will appear. I also tried repatching a patched ROM again, and still get the 'memory has already been used' error. A ball ache of tedium to do, but the only way i could see how to replace the animations. You can simplify this a lot : just choose the same file when you save your patched firmware (remove "-patched" in the suggested file name). Be sure to make a backup of your original file. I tried that and it still says memory already used. It works on my side with my image (replacement of 0x1FA8). Can you please PM me one of your images, so that I can test it ? I can replace just one image but no more than that. I want to add multiple images, frame by frame. Ah, i c. I am using TRN_174.BIN for the pro (i dont have an LE). I will try with that, but i wont be able to try the modified rom on my pro machine. Will i? Ah, i c. I am using TRN_174.BIN for the pro (i dont have an LE). I will try with that, but i wont be able to try it on my pro machine. Will i? The image format of my gem images is .jpg (the only format the pinball browser will let me upload). In v1.45, the specific Tron memory test is based on the file name. That's why the app is not working with your file. Just rename your file to TRN_174LE.BIN, and it will work (I made the test). In next release, I'll check for TRN_174* (and not only TRN_174LE.BIN), and it won't be necessary to rename it. It does work now, but only with raster-12 images. I can place a single image with a raster-0, but not a succesion of images. Why is this? I have managed to get my little animation into the ROM, but its where the FLYNN sign sequence starts @ 0x832. Does swapping modified code (of the same nominal version) cause a reset of stats and scores on a machine? If this thing could export the audio as clean wav files, things could get very .... interesting. I would assume yes...you are basically doing a code update, right? If wiping the CMOS is part of the update procedure, and not part of the bootup procedure, yes... For example, I know that swapping between MM 1.09 and 1.09C doesn't erase anything, because the ROMs are the same version, although slightly different, and thus don't trigger a CMOS wipe on bootup after you switch chips. If SAM wipes it's nvram on boot, on a ROM version mismatch, the settings and scores may stay the same since the ROM code is still the same version. Or, does SAM write settings and scores to the same flash as the game code itself? They would definitely be lost in that case. Wondering what specific games this means. Could this eventually be used to customize rules? I'd love to see an IJ4 update. You did a nice animation ! I works on my side : I have replaced the 6 raster-0 images starting at 0x1fa8 with yours (see screen shot below). Again, if the filename is not TRN_174LE.BIN, you'll have a "no free memory" message. [EDIT]Starting with version 1.46, the filename does not matter anymore; no need to rename it. It didn't on my AC/DC : All the scores and audits were here after the update. But I don't know if it's because of the version number that didn't change, or because the file crc is wrong (the upgrade process ends with an error even if it works). Does anyone think that the audio might be stored in the sped up form to save memory space? I remember back when musical instrument samplers had tiny memories, that the samples would be "stretched" at a lower pitches because it saved a lot of memory. I don't think so as it would be necessary to modify the embedded codecs. For those who cannot replace images because there is not enough memory, version 1.46 is available for download. Makes a lot of sense to me, I was thinking either that or just a different sample rate for vocals and low fidelity stuff, perhaps somewhere in the neighborhood of 22050hz? Awesome. I'm working on a much better animation for the gem finger sequence and this makes my life a lot easier. Thanks. It would be great if you could post a small video of what you get on your pinball ! Again, if the filename is not TRN_174LE.BIN, you'll have a "no free memory" message. [EDIT]Starting with version 1.46, the filename does not matter anymore; no need to rename it. Can you upload this modified rom for us to try? The one Russo121 modified is giving me a crc error and won't load. Perhaps the way you inserted the frames overwriting the other frames will be succesful. - I did not change anything in the frame replacement algorithm. I have just improved the way the app is looking for free memory. Previous versions were only looking at the place where I found free memory in AC/DC. New version is looking in the whole firmware. - As I don't have any Tron pinball around, I just tried the app, not the upgrade. Sorry if that was not clear. - The error at the end of the download is normal. That what I got on my AC/DC too. But even if it says something like "upgrade failed", the images have been upgraded. As it was working, I did not investigate on this; if this is an issue on some pinballs, I will. The easiet thing to do is to replace the Stern logo and try the upgrade. Are you loading the rom into the pinball browser or into a real machine? It works fine in the 1.46 browser as well as 1.45 for me. I will redo the animation like oga mentions so it will hopefully be in the right place. Was this segment used in Spiderman? If I recall this was the part in Spiderman-3 where venom made this in the web... Its really interesting peeking inside these animations. Look how much free space is still left in this one.